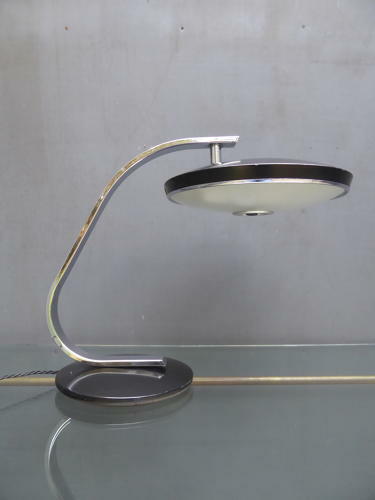 A fantastic vintage black & chrome desk lamp by Fase, Madrid. An iconic design classic featuring original black paintwork, contrasting chrome detailing & a large articulated shade with twin bulbs & an opaque glass diffuser. An absolute stunner which looks even better once illuminated. Near pair available, please see separate listing. Wear commensurate with age, chrome very good, paintwork all original with a few expected light scratches to the paintwork, glass diffuser damage free. A cracking example. The lamp retains it's original wiring & all electrical items should be checked by a qualified electrician prior to use.